From Vellore, a travel towards bangalore highway, less than one hour Journey place called Ambur an ancient Powerful Anjaneyar Temple is located. Devotees of Sri Anjaneya know this place for the presence of Sri Anjaneya temple which is popularly known as “Sri Periya Anjaneyar kovil”. “Periya” in Tamil means big. The Sri Anjaneya gets the word “Periya” prefixed because the murti of Sri Anjaneya is very huge and the figure is about eleven feet tall. 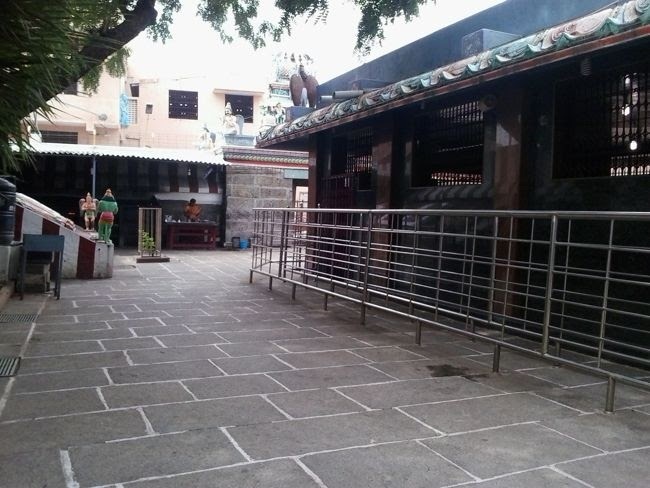 The temple is located about two kilo meters from the main bus stand and railway station. The uniqueness of Sri Anjaneya of this temple is that He is seen with Sri Saneescharan under His lotus feet. As one enters the road that leads to the temple, one could see the big arch proclaiming the temple premises. Before entering through the archway to the temple, on to the right side of the temple road there is a big portico shed in which cows had been sheltered and the temple authorities are maintaining a huge “Goshala”. 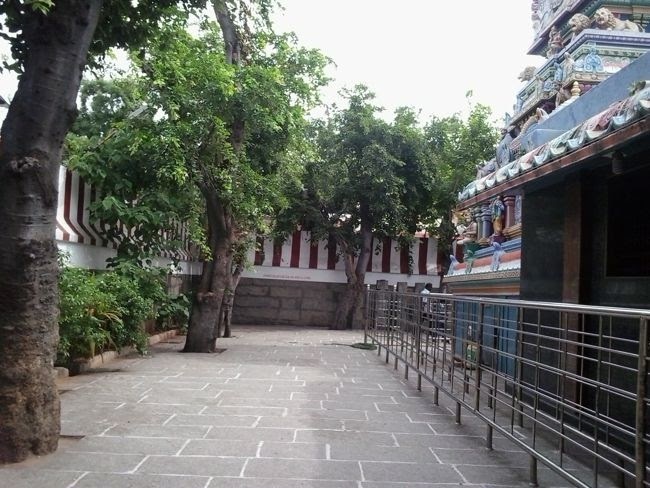 Adjacent to this Goshala there is another archway which leads to an “annadhana kootam” which can accommodate about two hundred people is found, where devotees are given free food every day. On entering the main archway, on the left side the administrative office is found. On the right side there is a temple kitchen and an embossed art work in which the ‘namam’ [mark of srivishnava] accompanied by disc and conch are present. In the middle of the open space is the ‘deepa stambam’ which is about fifteen feet tall which is facing ‘Garbhagraham’. Devotees light deepam underneath this ‘deepa stambam’. Just opposite this is a huge hall where devotees can stand and offer prayers to Sri Periya Anjaneyar. At the end of this hall is the ‘Garbhagraham’. 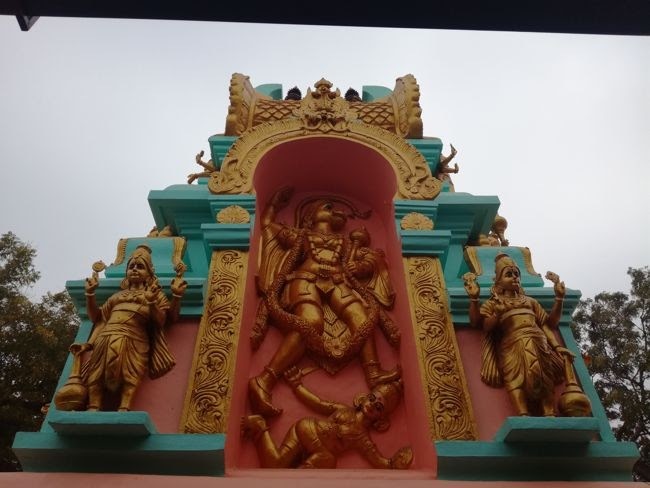 One may not be able to see the main presiding deity of this kshetra from the deepa stambham, instead there is another Hanuman vigraham which can be seen. The main presiding deity Sri Periya Anjaneya is residing slightly on to the left of main door of the garbhagraham. Devotees can have dharshan of the Lord only when they are standing near the main doorway of the Garbhagraham. On the parikrama of the garbhagraham on all the three sides there is embossment figure of conch and disc accompanying ‘namam’. Right on the back of the garbhagraham there is four pillared mandapam which houses few centuries old stone engraved. The inscription dating back to 1489 by the Madaleswara of Vijayanagar, Sri Uttra Sadasiva Rayar states that this temple had been renovated as per the request made by Balicha Naidu community people of Ambur. On the south west corner is the ‘sthala vriksham’ ‘Nelli’ [goose-berry tree]. Ravana the king of demons with Lanka as his capital, had won all the mighty and Devathas including Navagrahas. He commanded over them at his whims. Ravana had abducted Sita Devi and kept her at Askoka Vatika in Lanka. Sri Anjaneya brought the news on whereabouts of Sita to Sri Rama who was in search of Sitadevi. To rescue Sita from the clutches of Ravana, Rama had to go on war with Ravana to Lanka. In the war that ensued, Lakshmna brother of Rama was struck with a mighty weapon and was struggling for his life. On the advice of Jambavan, medicinal herb from Himalaya was to be brought to save Lakshmana. The mighty task of going to Himalaya from Lanka overnight could be accomplished by Sri Anjaneya only. Therefore Sri Anjaneya was asked to perform this great task. When Sukracharya the Guru for demons came to know about this, he advised Ravana to prevent Sri Anjaneya from going to Himalayas. He said that he can command Saneeschara to hold on Sri Anjaneya so that he will not be able to do the task. On this advice Ravana told Saneeschara to fix Sri Anjaneya so that He will not be able to bring the herbs for rescuing Lakshmana. Even before Saneeschara could take off for the assignment, Sri Anjaneya had got the herbal mountain and was returning from Himalayas. When Saneeschara approached Sri Anjaneya, Anjaneya could see the game plan of Ravana. Sri Anjaneya told Saneeschara that mission of Sri Rama will not wait for anything and brought Saneeschara under His feet and held tightly. Wailing in pain under the grip of Sri Anjaneya’s feet, Saneeschara asked for mercy from Sri Rama and said : "O Rama, I will not hold (even see) those who spell your name or Maruthi's name even for a kshanam (micro - second)", with these words Sani Bhagawan goes to his abode. Since Saneeschara had taken the name of Sri Rama, Sri Hanuman pardoned him. Sri Anjaneya murti of this kshetra depicts this scenario. Lord Sri Periya Anjaneya Swamy of Ambur, is about eleven feet tall. He is in walking posture and the carving is of ‘ardha shila’ type. Lord is seen walking eastward with His left lotus foot adoring thandai in the front. His right lotus foot is seen slightly raised from the ground. Saneeschara is pinned below Lords’ lotus feet. The head is trapped below the left lotus feet of the Lord, and his feet trapped below the right lotus feet of the Lord. Saneeschara’s face looking at nobody and is directed towards the ground. Lords’ left hand adorning bracelet and an upper armguard is seen holding the stem of sowgandika flower. The flower in half blossom state is seen above His left shoulder. He is wearing three ornaments which adore His bosom. The yagyopaveetham of the Lord is seen bright across His bosom. With His raised other hand He offers ‘abayam’ and showers blessings on His devotees. The tail of the Lord rises above His head with a curved end which is adorned with a very small bell. Lord is wearing ear-studs and His kesam is neatly tied as is the case of any Brahmachari. Small head band adorns His head that looks as if He is wearing a crown. His eyes are glowing with karuna which is showered on the devotee. 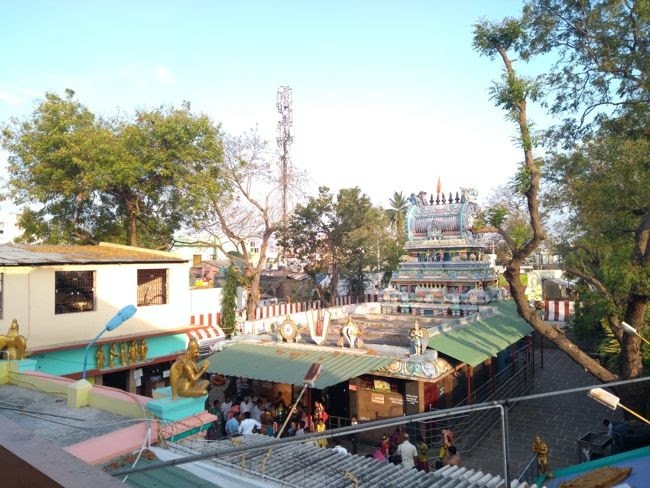 This is most popular Anjaneya temple said to be 600 years old it was rebuilt during Vijayanagara period and is in the heart of Ambur town in Vellore District and just 2 kms from Ambur Railway Station and Autos ply to this temple. Ambur which falls in the domain of Vellore District of Tamil Nadu is famous for the tannery and shoe making industry today. One can reach this town by Rail, which is located on Chennai-Bangalore main line. 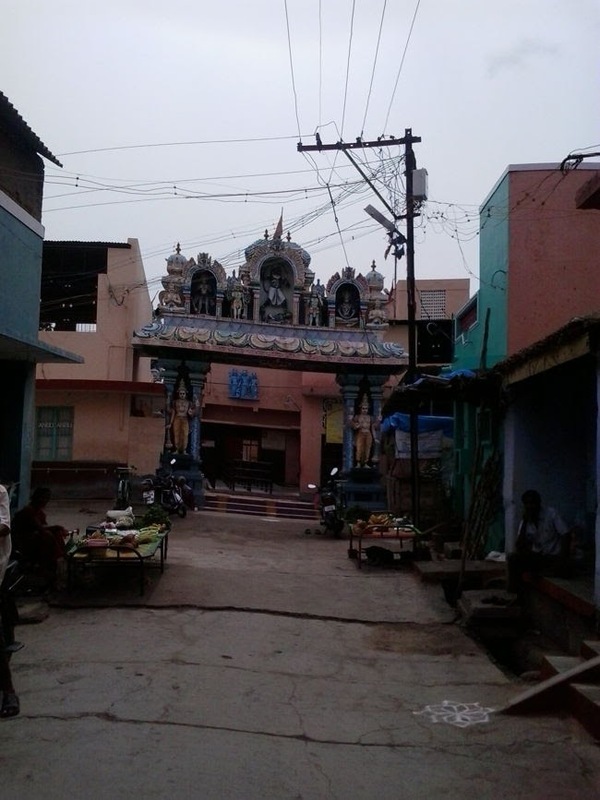 The town gets its name “Ambur” which means “our place”. Frequent travellers of Bangalore-Chennai line know this town for the Jasmine flower they can buy during the brief stop at this station.